December | 2009 | Larval Subjects . With the exception of the object-oriented panel, the titles and themes of these sessions are soft, as well as the people presenting on each panel (i.e., they might be moved to another panel depending on the topic of their talk). Certain themes might change as well. If we get a slew of folks interested in OOO or SR we might turn another panel into an SR-OOO panel. Likewise, the STS and Media Studies panel might become something else. Anyone is free to submit a proposal to Joe Hughes or I. We still need talks for the STS and DM panel and the Lacan, Zizek, and Badiou Panel so if you’re interested contact me or Joe Hughes to pitch a proposal. For more information see the RMMLA website here. Listings for the panels can be found here and here. Alex Reid has a couple of interesting posts up discussing the relationship between OOO and rhetoric (here and here). Right now my brain is mush from grading all day, so the best I can muster is “yes!”. Maybe Alex can join Graham, Ian, Eleanor Kaufman, Joe Hughes and I at the RMMLA this October to discuss these issues further. Setting aside the question of what properties societies must have to be known, here we get the basic structure of Bhaskar’s form of transcendental argument. Where the transcendental idealist begins with the question of what our minds must be like for knowledge to be possible, the transcendental realist begins with the question of what the world must be like for it to be knowable. Over at his blog Ian Bogost attempts to provide a definition of OOO suitable for an elevator pitch to the layman. A very interesting discussion has ensued. Read the post here. Object-oriented social and political theory can be illustrated with respect to Lacan’s famous Borromean knots. It will be recalled that the peculiar quality of the Borromean knot is that no one of the rings is directly tied to the other, but if you cut one of the rings the other two slip away. In evoking the Borromean knot I do not here intend to give a “Lacanian reading” of object-oriented ontology. Rather, I wish to draw attention to certain features of the social and political world that object-oriented ontology would like to bring into relief for social and political theorists. Consequently, in what follows I will take a certain degree of liberty in how I use the categories of the “real”, the “symbolic”, and the “imaginary” (abbreviated “R”, “S”, and “I” respectively), only loosely associating these with Lacanian psychoanalytic categories. I will not, for example, discuss the real in the Lacanian sense as the impossible, as a constitutive deadlock, as what always returns to its place, or as constitutive antagonism. This is not because I am rejecting the Lacanian real in these senses, but rather because I am here using the Borromean knot for other purposes. I have no qualms with reintroducing concepts such as constitutive deadlocks or antagonisms at another order of analysis. In short, I am using the diagram of the Borromean knot as a heuristic device to help bring clarity to certain discussions in social and political theory. Thus for the purposes of this post, let the ring of the Imaginary refer to the domain of ideology, signs, group identities, political parties, images, the content of media, the sense or meaning possessed by cultural artifacts such as films, clothing, commodities, certain norms, etc., collective narratives, texts, and so on. It is important to emphasize that in placing these in the ring of the Imaginary I am in no way suggesting that these things are unreal or demoting their status. Here the category of the Imaginary retains some of its Lacanian resonances. Lacan associates the imaginary with the domain of meaning (hence the reference to cultural artifacts, texts, signs, etc). Likewise, Lacan associates the category of the Imaginary with images (visual, acoustic, olfactory, tactile, etc), as well as the domain of the ego and identity. Hence the placement of group identities, group narratives, and media in this category. By contrast, let the symbolic refer to the domain of laws, institutions, governmental systems, economy, as well as language, and so on. Again certain Lacanian resonances are retained here, especially with respect to placing law and language within the domain of symbolic. 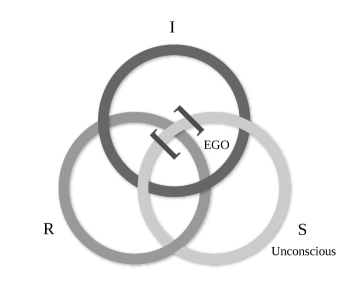 Neurophilosophy: Thomas Metzinger (The Ego Tunnel) and Alva Noe (Out of Our Heads) draw opposite conclusions from the same experimental data… Metzinger takes recent neurological research as proof that consciousness is entirely delusional, a false representation of what is going on in our brains, and a virtual simulation of the outside world. Brassier of course picks up on this. Noe, to the contrary, argues for a post-pragmatic, embodied and distributed notion of consciousness, undermining any dualism of inside vs outside, or self vs world. But what makes this even more interesting is that he argues this from much of the same scientific data that are the basis for Metzinger’s diametrically opposed claims. Here I hope Steven won’t mind that I’ve condensed a couple of his posts together. Bhaskar argues that we must be vigilant with respect to the “nocturnal philosophies” of scientists. I take it that when he refers to “nocturnal philosophies” he’s referring to the specifically philosophical implications they draw from their research, independent of what that research directly shows. Thus, for example, you get nocturnal philosophies among a number of researchers in quantum mechanics, as well as in biology. Now, there is nothing a priori wrong with nocturnal philosophies. It’s just important for us to be aware that they are philosophies and not identical to the scientific findings themselves. Returning to the specific discussion of neurology and its implications, the question to ask, I think, is whether consciousness has any powers of its own. Here we have a clear criteria for emergence and the individuation of objects. We can agree with both Noe and Metzinger that where there are no brains there is no consciousness, just as we can agree with the chemist that where there is no hydrogen or oxygen there is no water. The ontological question revolves around whether consciousness is exhausted by its neurological explanation or whether consciousness has powers and capacities of its own that while impossible without the neurological are nonetheless unique powers of its own. If consciousness has powers of its own, then it would be an object of its own. If not, then we would be warranted in excluding consciousness from our inventory of what is or what exists. With respect to this latter option, consciousness would merely be an effect and would not be a being in its own right. It’s important to emphasize here no substance dualism is being asserted here. In entertaining the hypothesis that consciousness is a distinct object in its own right, the point is not to claim that consciousness could exist independent of brains, that it is separable from brains, or that it has spooky powers at odds with its neurological substrate. I would argue that water is distinct as an object from hydrogen and oxygen or even the relation between hydrogen and oxygen. This is because water has powers that are found in neither hydrogen or oxygen, nor in a single molecule of H2O. For example, water can wet paper and slide about on a table, yet a single molecule of H2O does not have these powers. The powers of water are entirely consistent with those of atomic chemistry, but something new emerges when these atoms are linked together and when molecules of H2O are linked together. The question is whether or not something similar is the case with consciousness. Does the emergence of consciousness generate powers that cannot be found at the lower level stratum upon which it is based? That would be the question and would be determinative of whether or not things like subjects are themselves objects. Principally, I am at odds with the idea that systems which are sympathetic to Science need be seen as diminishing the subject. I don’t see yet that anyone has convincingly reversed the copernican turn… I just don’t feel that the base objectivity of the subject or the equal footing on which the subject and the object stand in the wider realm of nature are sufficient bases to overturn the philosophical vantage point that only the subject can enjoy. Again, that is with the concession that that subject is objectively construed, and in that sense I have sympathies with OOO, OOP, etc, yet I do not see the innovation here. It is mainstream knowledge that we are material constructs – a notion that wouldn’t have upset or even suprised my late Grandmother, who passed away long before Brassier even completed his doctoral thesis! What would be a truly great innovation would be the the ameliorisation of an ethical code to our objective existence, that could maintain an objective basis, without becoming hoplessly sentimental. If a proponent of OOP, OOO, SR or any other affiliated or non affiliated thinker could do that, then I’ll be porting my commitments to there’s! To be clear, I was only pointing out that in his post Mike treats the subject as an object, while nonetheless rightly attributing a number of unique qualities to this particular object. The rest of his post can be read here. In his comments I get the sense that Mike is running together object-oriented ontology with the position of Ray Brassier. This is understandable as he already admitted earlier that he hasn’t read much of the other Speculative Realists and has most been focused on critiquing Brassier (and thank god for that! ), but it is important to underline that object-oriented ontology differs fundamentally from Brassier’s position and from that of the other Speculative Realists as well. One important point, right at the outset, is that OOO, while certainly wanting to make room for the objects or generative mechanisms discovered by the sciences, doesn’t see them as exhausting the real or being more real than other sorts of real objects or generative mechanisms (subjects, numbers, symbolic entities, societies, works of art, etc. ).